Every blogger has their own ‘kit’. A bunch of things that they need whether they write professionally or for themselves. For some it may just be an app on their phone and/or a laptop. For others they include a top spec camera, a pile of beautiful notebooks, a well organised desk and private work area, all of the latest photo editing software, organisers, outfits and bags and all kids of stuff. I suppose the more serious you get, the more you have in your kit. But there is one piece of kit that no blogger should be without and that is the business card. You just never know who you will meet, what opportunities you will come across and having that one tiny piece of card with all of of your information in one place is very hard to beat. Believe it or not, people ask for business cards. How embarrassing would it be if you were asked for yours and you didn’t actually have one? I’ve often thought about this, so when I heard that Colour Graphics were looking for reviews, I figured I’d be crazy not to contact them. Colour Graphics are based in the UK and print all sorts from business cards and leaflets to roller banners and posters for displays and exhibitions as well as being able to print on a range of machine washable fabrics. The business cards start from £21 for 50 single sided 400 gsm premium un-laminated cards. They also do a gloss detailing which does look lovely but I didn’t really have a need for it on my design so I selected just the basic, un-laminated double sided cards. Once you have selected the type of card you want, there is an artwork supply guide for you to go over that gives you the information you need regarding resolution, dimensions etc. It also points out that you are responsible for making sure that the information on the card is correct so its always worth double and triple checking your artwork. From there, you add the cards to the basket and select the delivery option. Standard delivery of 4 days is free but they also provide 1, 2 or 3 day delivery options for an extra cost. Once your order has been placed, you can then email them your artwork and just wait. One thing I found impressive was the communication. I received emails along the process keeping me updated with my order. When I received them I was very happy. They arrive in a small plastic box to keep them neat. I took one out to check over and was very happy with the accuracy. Everything was just as I’d supplied and all information was correct. My blog layout is quite simple and just black and white so I wanted the cards to match. On one side I just simply have my logo and the other side is my contact info so my name, web address, email, phone number and both my twitter and facebook info. Thinking about it now, I should have perhaps added my instagram too but never mind. There is quite a lot of open space on my business card which I’ve read is important for anyone I give them to, to be able to make notes about me or my blog or even what we plan to work together on. 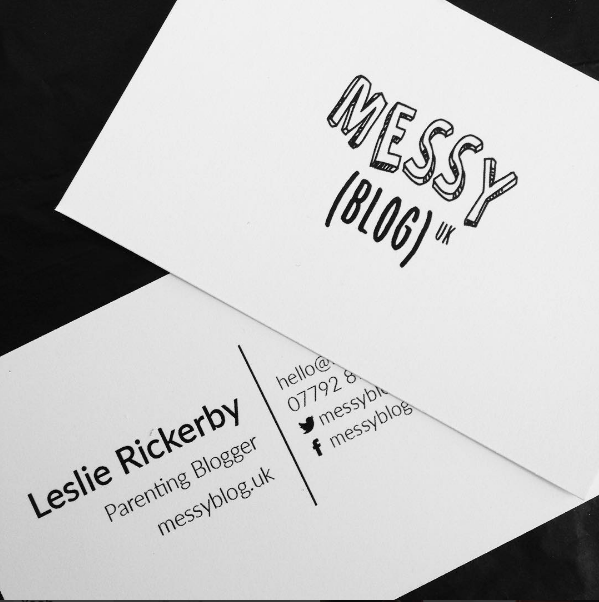 As yet, I’ve not been to any blogging conferences but now that I have my business cards, I feel that should an opportunity present itself, my ‘blogging kit’ now has all of the tools I need to start making some wonderful relationships.